The CasITa-to-5k headed over to Veterans Parkway for our run tonight. 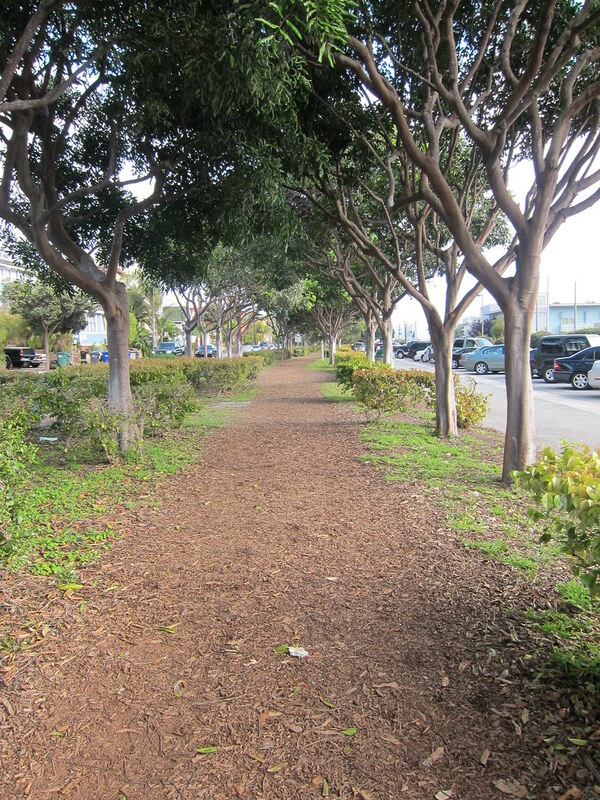 Veterans Parkway is also known as the Hermosa Valley Greenbelt. It is a former railroad corridor that has been converted to a 21 acre park with a wood chip rail trail. A section of railroad track is still visible in the Fry's Electronics parking lot and is a remnant of the Santa Fe railroad line that was built back in 1888. 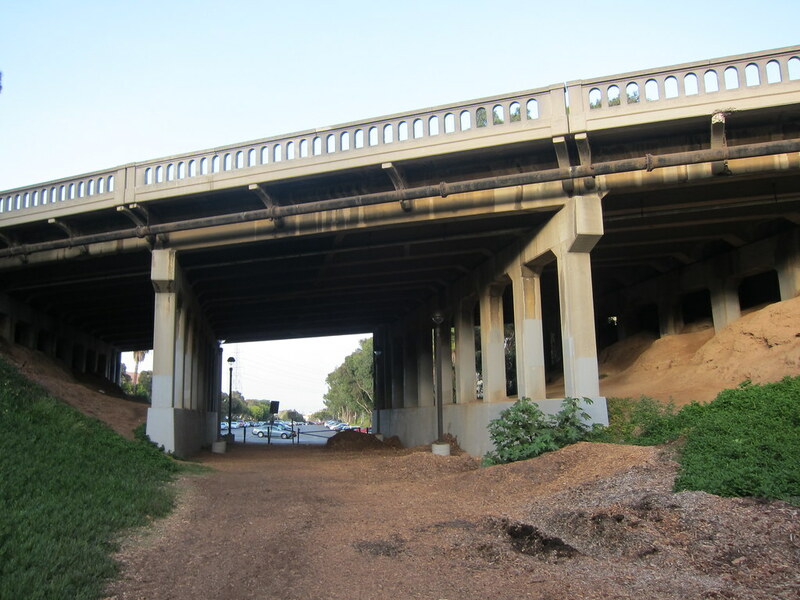 We parked and walked timorously under the ominous Sepulveda Blvd. 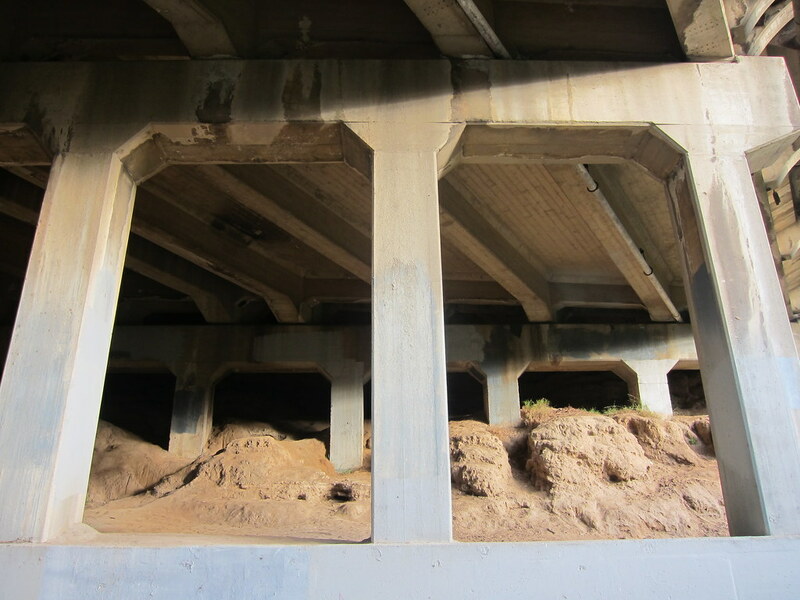 overpass to the beginning of the trail. 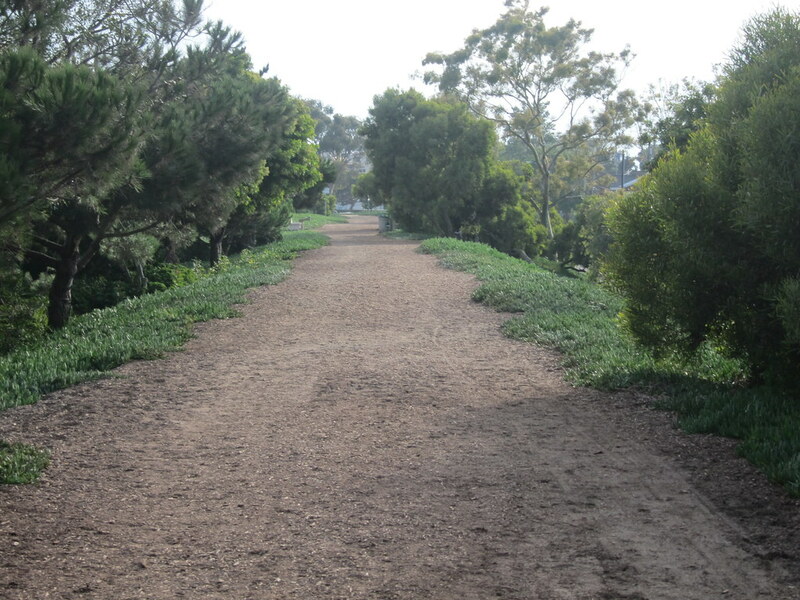 Once the path was in view, its quiet beauty calmed our nerves and we eased into our brisk warm-up walk. This was my first time running on shredded bark so I wasn't sure what to expect but it was similar to running on a sandy trail. We followed the path as it ran through a strip of lush greenery. We spotted several butterfly sculptures that were part of the 'The Mariposa Pathway Butterfly Totems' public artwork. The totems were created to honor the trail's Monarch butterflies. 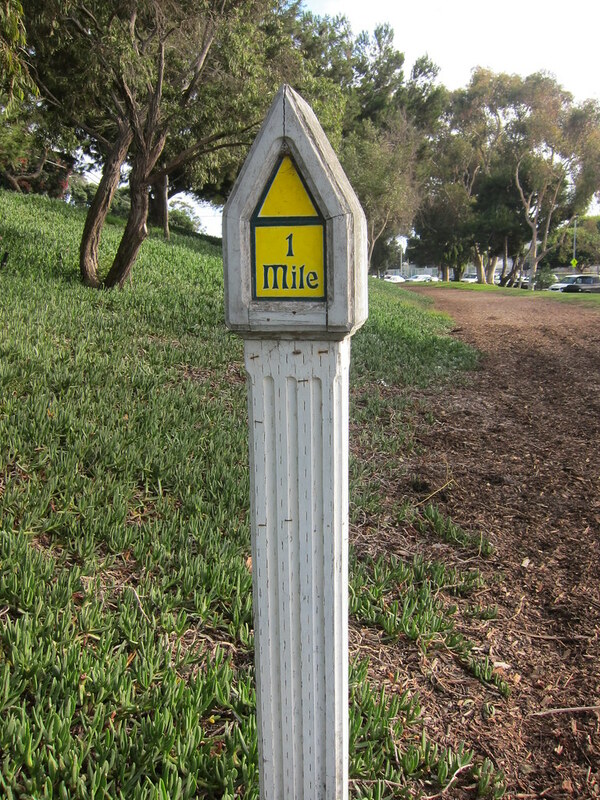 The green way even featured posts with prominent 1/4 mile markers. The dark marine layer that had blanketed the city all day lifted and the bright blue sky shined through the haze. Signs indicated leashed dogs were allowed on the path but bikes were forbidden. As we headed south, large homes and businesses bordered the path on either side. At this point, the chip path essentially became a traffic island. 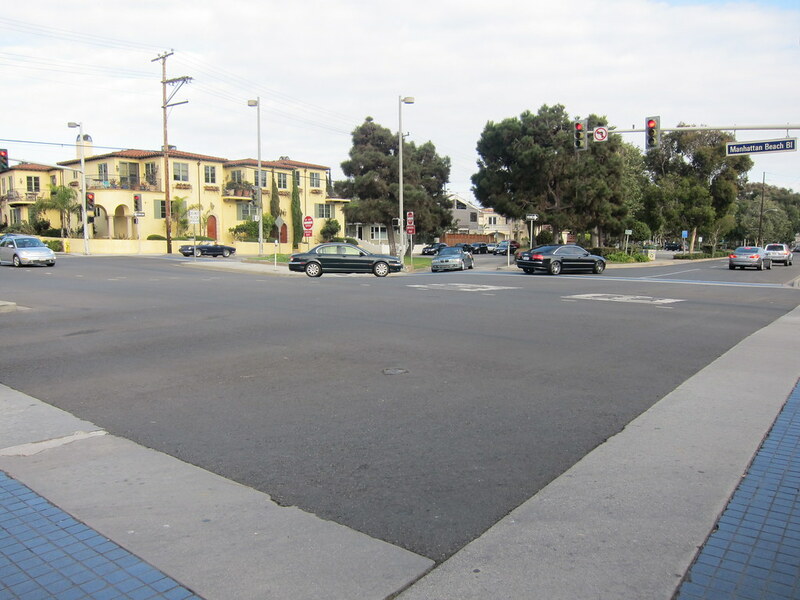 When we reached Downtown Manhattan Beach, we were unsure how to navigate the intersections. The first time we crossed, we obeyed all the street signals and followed the blue paths. On the way back, we sprinted behind another runner across several lanes of traffic and narrowly dodged the vehicles speeding by. The view back into the Fry's parking lot from the trail was not nearly as inauspicious as our initial impression from the other side. I'm looking forward to revisiting this trail in the future and running it in its entirety. Sounds like a lovely trail. And it also sounds like your foot must be holding up ok? That's excellent! Yay for a good trail run! That looks like and awesome trail to run on. You always have very interesting runs. Looks like a great trail!! I love your pictures. Like national geographic. Cool trail. Always good to have more places that are safe to run and soft on the joints.